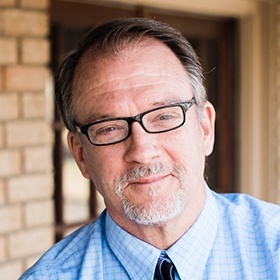 Dr. Swearingen grew up in Oklahoma City, attending Oklahoma State University before pursuing his Doctor of Dental Surgery at the Oklahoma University College of Dentistry. He has also undergone advanced post-graduate training at the prestigious Seattle Institute of Advanced Dental Education and in Invisalign® Clear Aligners. Today, his career at his current practice spans over 30 years now, with hopefully many more on the horizon. Dr. Swearingen’s favorite part of his dental work is being able to help patients and develop trusting, friendly relationships with people from all walks of life. Dr. Swearingen met and married his wife of 33 years while in college, and they have two grown sons together named Garrett and Logan. Outside of the dental office, his hobbies include running, biking, hiking, drawing, collecting artifacts, landscaping, gardening, fishing, and trying new restaurants. He’s done many interesting things throughout his life, including swimming with sharks and dolphins, practicing Tae Kwon Do, and running marathons. He wants to do the Great Wall of China marathon at some point!